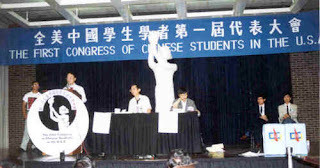 On July 30, 1989, after 3 days of meeting in Chicago, more than 350 delegates selected by Chinese students all over the US officially announced the formation of a new organization: the Independent Federation of the Chinese Students and Scholars (IFCSS). Wuer Kaixi and Yan Jiaqi atttended the meeting as invited guests. This is the first time they appeared publicly in US after their escape from China. During the entire 1989 student movement, Chinese students in the US had adopted a very supportive stance from abroad. They launched several demonstrations in major US cities to support the movement at home and collected donations that were sent back to Beijing. After the massacre, large-scale demonstrations took place all over the US. Almost all local student unions officially severed any ties with the Chinese embassy. The new IFCSS was organized in a way similar to US government, with a headquarters, a concil, and a supervisory committee forming three branches of shared power. Dr. Liu Yongchuan (刘永川) from Stanford University was elected as the first President. IFCSS would become the most active and influential China lobby in the US, laying groundbreaking work for Chinese participating in US politics. Most significantly, they successfully pushed through the 1992 Chinese Student Protection Act, which granted green cards to some 54,000 Chinese nationals in the US. On the other hand, they were not as successful in lobbying for economic sanctions and the revoke of China's Most Favored Nation status, due to the strong resistance from the Bush administration. In late 1990s, IFCSS gradually lost her grassroots support and organization power and faded out from public domain. To this day, a skeleton organization still exists with her main activity being leading commemorative at anniversaries of the massacre.